Place noodles in a large heat-proof bowl or a pot and pour over boiling water to cover. Stir briskly with a fork to stop noodles from sticking together. Leave to soak for about 10 minutes or until noodles are just soft and pliable – be careful not to overcook noodles (or they risk being gluggy when you stir-fry them). Drain and rinse under cold water to help prevent noodles sticking together. Heat oil in a wok or your largest non-stick fry pan on medium-high heat. Fry mushrooms for 1-2 minutes, then add lemongrass, kaffir lime leaf, white part of spring onions and garlic and continue cooking for 1-2 minutes. Add drained noodles, green part of spring onions, beansprouts and sauce. Stir-fry, tossing all together, for about 3 minutes until hot-through. Push noodles to one side of the pan and add whisked eggs to other side of the pan. Scramble eggs around a bit, then leave for a couple of minutes to set as an omelette. Once they have set as an omelette, roughly chop them up in the pan with a wooden spoon and then toss through the noodles. Turn off the heat. 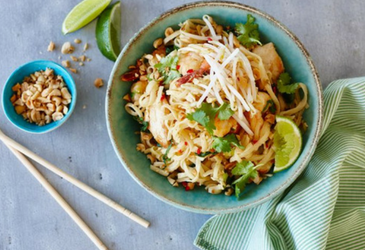 To serve, divide noodles between plates and top with peanuts or cashew nuts, more beansprouts, chilli and coriander. Serve with a lime wedge to squeeze over just before eating.